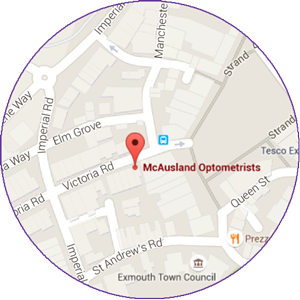 McAusland Optometrists is an independent opticians in Exmouth town centre, run by husband and wife team Keval & Sneh Sejpar. The practice was originally established in The Parade by Caroline & Andrew McAusland in 1984 and moved to its present location on Victoria Road in 1999. Keval & Sneh swapped leafy Hertfordshire for the East Devon coast to join the practice in June 2014 and ultimately took over the reins upon Caroline & Andrew’s retirement in 2015. Much has changed since our inception in 1984, but our ethos has remained the same. We pride ourselves on keeping up with the latest advances in technology to make sure that we can offer our patients the best possible eye care. This goes hand-in-hand with our reassuringly thorough approach to eye examinations – meaning you never feel rushed and there’s always time to ask us questions. This was highlighted when we became one of the first in the country to be accredited as an Eye Promise practice. We personally select the frames, lenses and contact lenses that we feel are best for our clients and, as such, we are confident that we can always help you find a product that’s well-suited to your personal requirements. We have longstanding links with companies such as Essilor, Zeiss, Maui Jim, Silhouette and Tom Davies, and our experienced opticians are well-practised at tailoring prescription lenses to your individual requirements – including varifocals and other occupational & sport-specific lens types. Conveniently located just off The Strand with disabled access and an hour’s free parking outside, we’re very easy to get to. We love getting to know all the family, from grandparents to grandchildren, and we hope you’ll choose us to look after your family’s vision. In the meantime, you can Meet the Team here.